Razor A Kick Scooter-You Need To Know Everything! With the Razor A Kick Scooter, your child can go from point A to point B in style. This two-wheeled wonder comes from a line of scooters brought to you by the California-based company Razor USA, and it has gained enormous popularity from kids (who love using it to get around their neighborhoods, and for the coolness factor) and parents (who find it a great way to get their children to get out of the house and exercise) alike, as well as numerous awards including, “Toy of the Year” from the Toy Industry Association and Time Magazine. It is also one of the highest rated items on Amazon.com, with an average of 4 and a half stars from many satisfied customers. The Razor A Kick scooter is made up of strong, Aircraft-grade aluminum T-tube and deck. This toy stands at 26 x 13.5 x 35 inches tall. With its adjustable handlebars, this toy is rated for kids aged five and up, and has a maximum rider height of 143 pounds. The height from the wheel to the handlebar measures 33 inches. It is lightweight, compact and portable, weighing approximately six pounds, and can be carried around in a bag after use. When folded, it measures 23.75 x 4 x 7.25 inches. It features rear fender brakes for quick stops. This scooter has 98mm urethane wheels with ABEC bearings. This toy is great for both boys and girls, and it comes in five colors: red, blue, pink, green, and black/clear. This item comes with a 6-month warranty. Razor USA also offers a variety of accessories for this product, such as scooter wheels, deck grip tape, and handlebar grips in fun colors so you can personalize your ride. 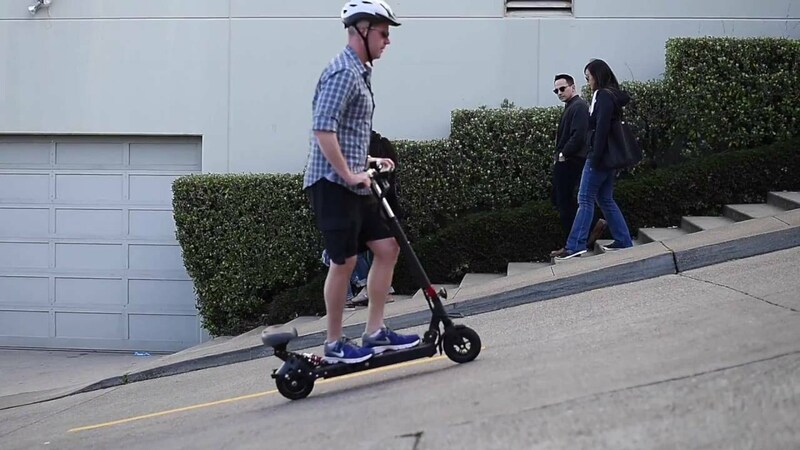 The scooter can withstand massive use and abuse and gives good value for your money. This product requires some assembly and a 5mm hex key. If you have no idea what a hex key (aka an Allen wrench) is or how it’s used, ask someone to help you. In a time when kids are in danger of becoming overweight from lack of exercise, many parents are at a loss to find ways to keep them active and healthy without the drama of forcing them to work out. With that in mind, the Razor A Kick Scooter is not just your average toy, but also a sneaky way of adding some sort of physical activity to your child’s daily routine. Little boys and girls typically like to do as their older siblings do, so when they see the latter going around in a scooter, they will surely beg you to get them the Razor Kiddie Kick Scooter. This scooter, which is manufactured by award-winning firm Razor USA, is great for kids aged 6 and younger, allowing them to keep up with their older siblings in a ride that is just the right size for them. It also comes in two fun colors: blue, with orange handlebar grips and wheels; and pink, with purple handlebar grips and wheels. Parents, on the other hand, love the great value for money and sturdy construction. Currently, it ranks in the top 100 in terms of sales in its category on Amazon.com. This is definitely one item you cannot resist buying for your little one. 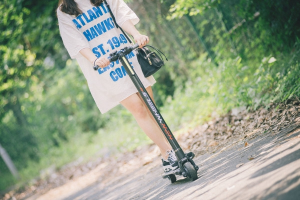 You may have some reservations about getting your younger child a scooter of his own, especially since he is at an age where his balance and coordination are not as well-developed as that of an older child. But no worries about this particular scooter! It was designed with the physical capabilities of a child in mind, all without sacrificing performance and the quality of the ride. The Razor Kiddie Kick Scooter is almost exactly like what the big kids have, with a few special features. With this ride, it’s all about the details. On other scooters from the same manufacturer, you’ll notice that they have an in-line two wheel design (front and back), whereas the Razor Kiddie Kick Scooter has three wheels for better stability: one in front, and two at the back. This allows for a wider deck and rear-wheel base, which is made of slip-proof, impact-resistant plastic. This makes it easier for a child to keep his feet on the deck while riding the scooter. While it is less maneuverable and not as fast as the scooter models aimed at older children, it is still extremely fun and easy to ride. Your child will not be able to attempt any cool scooter tricks on this particular ride, but who wants a 3-year old daredevil to perform those anyway? Of course, as with any sort of sporting activity, your child must be equipped with the proper riding gear before racing down the street on his hot new scooter. This means getting a correctly-fitting helmet and knee and elbow pads. You can get these in fun colors and designs to match your child’s new Razor Kiddie Kick Scooter. The Razor A2 Kick Scooter can be a great motivator to get your kids to get moving, and a sleeker alternative to riding a bicycle. In a time where sedentary habits like sitting on the couch all day and watching TV or playing video games have been blamed for causing children to become overweight, this toy can make exercise fun, easy, effortless, ah oh-so-cool. This is one of the reasons why scooters are popular with both parents and children alike, and it is a hot item on many shopping or wish lists. Shoppers on Amazon.com have given it a perfect score of five stars. But don’t just take anyone’s word on it, this is definitely one toy that you have to experience. Even better, it’s affordable and gives great value for your money, so there’s no good reason why you should resist snapping one up right now. No need to wait for a special occasion with this toy. Standing at 33 inches from the top of the adjustable handlebars to the 98mm in-line style urethane wheels, this foldable scooter’s T-tube and deck are made with eight pounds of aluminum that airplanes are made up of, making it lightweight and yet strong enough to withstand constant use. Once folded, it is small enough to fit in a bag if you want to keep your hands free for other things, or for storing away. The Razor A2 Kick Scooter comes in five fun colors that any child, whether boy or girl, will love: black/clear, green/silver. red, blue, and purple. This is one step up from your average scooter, as it boasts of front spring-less suspension, rear fender brakes, and a wheelie bar similar to what you’d find in more expensive, performance scooters. These make a difference in the quality of the ride and the ease of stopping, so your child can avoid face-planting on the sidewalks. Before buying this particular scooter, you must know that it is rated for riders aged five and up, and weighing no more than 143 pounds. As always, rider safety is important, and your child must be properly equipped with a helmet and elbow and knee pads while using this toy. (Tip: If you are buying this scooter as a gift for a child, pair it up with the safety equipment needed. You can even color-coordinate the helmet with the scooter so the child caqn ride in style.) The Razor A2 Kick Scooter will surely be a hit with your kids and make you the coolest parent on the block.